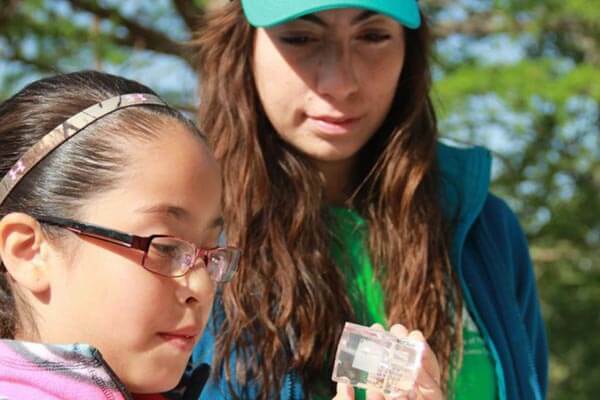 Most children would rather be outside than in a classroom anyway, so when a group of Environmental Science majors from St. Mary’s University treated students from Ingram Independent School District to a day of outdoor learning last March, they were all smiles. Professor Melissa Karlin’s conservation biology class guided nearly 60 5th graders as they hiked, dug and explored – all in the name of environmental education – at the Texas Catholic Boys Camp (TECABOCA) in Mountain Home. Throughout the day, the kids visited various stations designed by Karlin’s students, where they were able to partake in exercises on identifying native wildlife and vegetation, soil and water sampling and geology. The activities were a test-run of a pilot environmental education curriculum developed by Karlin and TECABOCA program director, Kay Tally-Foos. The program is designed to give secondary education students hands-on learning experiences in the environmental sciences and is under consideration by Ingram ISD to be incorporated into their academic curriculum. Karlin also noted that such a program would be just as beneficial for her students.